Cape Town - Orlando Pirates caretaker coach Eric Tinkler said that a more offensive strategy has been key to their improved performance. READ: Jele leads statistics vs Ajax. 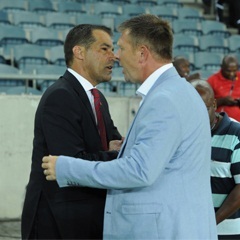 The Buccaneers beat Ajax Cape Town 4-0 on Saturday to give Tinkler his first victory in charge, building on his 2-0 debut loss to leaders Kaizer Chiefs and 1-1 draw with Mamelodi Sundowns last week. "It was vitally important for us to get this win under our belt," Tinkler is quoted as saying by KickOff. "It was important for the team to really turn around what has been a bad time for the club. "I’ve seen an improvement in morale, I've seen an improvement in the team spirit, but that could easily have changed if we had lost this match." When asked about what was behind their improved form, the former Bafana Bafana midfielder said: "We are playing with a far more offensive game than we had over the couple of months. "We are now putting the opposition under a lot of pressure. We are doing that with the numbers and when we are winning the ball, we are committing more bodies forward." The win leaves Pirates fifth in the table, just one point behind the Urban Warriors in fourth, and with a game in hand.